Kerupuk can (Chips) cute models, scale 1/6. 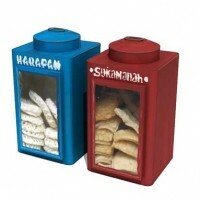 Kerupuk Can can be found at most traditional stores and culinary places in Indonesia. The shape is unique and the same at any place. For some Indonesian people, if don't consume kerupuk they feel like missing something and the worse, lost their appetite. Kerupuk ingredients are rice, garlic, pepper, sugar, coconut oil to fry. Laso there's a kerupuk that is made from cow skin, so it is called Kerupuk Kulit (Skin).